The Canadian Home Builders’ Association introduced the Tommie Awards in 1992 as a way to recognize the work of Home Builders in Okanagan. 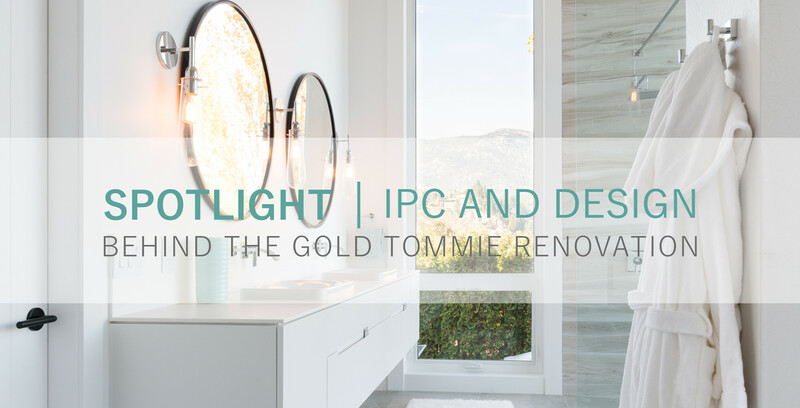 This year, IPC and Design won a Gold Tommie in the category “Excellence in Bathroom Renovation over $20,000,” and was also recognized as a Silver Finalist under the following categories: Excellence in Bathroom Renovation over $20,000, Excellence in Kitchen Renovation under $65,000, and Excellence in Other Room for the Thomson Residence. Ian Paine Construction Ltd started as a framing company, and later began offering project management services for companies in Alberta and British Columbia. By 1982, Ian Paine Construction Ltd had become a general contracting firm, specializing in custom built homes, renovations, and small commercial projects. Today, IPC and Design is a full service design-build company, building high-end custom homes that suite each clients needs. Approximately six years ago Ian Paine’s daughter, Krista Paine, joined the team and has been recognized for designing numerous award winning projects for both the Canadian Home Builders’ Association Tommies and the Architectural Woodwork Manufacturers Association of Canada (AWMAC) Award of Excellence. The renovated home that received the Gold Tommie this year was a 5 bedroom, 3.5 bathroom water front home. The home was built as a summer home that exuded a modern cottage aesthetic. The IPC and Design team discovered upon demolition that the actual home was once a rancher with the back-half of the property improperly built. The team had to re-build the back half of the home and added a whole second story. The master ensuite that received the Gold Tommie was located where the roof had previously been. What does it feel to win a Gold Tommie? Pure excitement!! Knowing all of our hard work paid off. Having our team recognized for our skill and determination to create beautiful spaces is a feeling like no other. Is there an iconic person you look up to for inspiration? Where do you draw inspiration from? My Parents! Growing up admiring my parents and their drive instilled strength. My mother, running a home business while we were young, then deciding to further her education to join a path she was passionate about and watched her steadily succeed. My father continuously grew his successful company for over 30 years and is still recognized today as being the “nice guy”. I envy their accomplishments and love taking a “page from their book” as I help IPC and Design grow. Together my parents inspire me every day to work hard and be the best I can be. 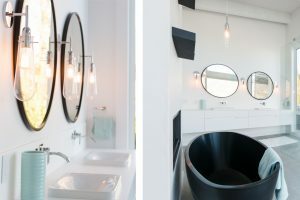 Why did you choose certain lighting fixtures for the ensuite?/ Was there a particular reason why certain light fixtures were chosen for the ensuite? We wanted to source something that was perfect for the modern cottage theme the clients requested. We felt the design in this master bathroom begged for a feminine and sophisticated wall sconce. We knew when we found them, they were perfect! When it came time to source a pendant over the tub, we were thrilled to find an option in the same collection. What is it like to work in a family business? A sense of complete comfort – knowing I grew up around this stuff. Taking on a new challenge is always a little scary, but working alongside my Dad made the transition easy. Pushing forward and keeping the same values and ethics my Dad ran this company with for so many years is unbelievably rewarding. What is your favourite feature of the ensuite renovation? This ensuite brought many amazing design aspects together to create a cohesive, relaxing, and utterly “wow” space. Choosing a favourite feature would be like choosing your favourite child. The matte black Blu freestanding tub anchors the space creating an initial jaw-dropping reaction. It is seamlessly tied in with circular black framed mirrors and accented with a black two-way fireplace and cantilevered shelves. The perfectly coordinated vanity sconces and single pendant over the tub add some glam to the space and the custom curbless 2-person shower with gloss wood wall accent is only overshadowed by the show-stopping painted glulam beams and lakefront angled windows. And possibly the best for last, the hidden integrated tub filler. It is not every day I get the opportunity to tell my clients I have a crazy idea and they immediately jump on board.